There's been a high security presence around England fans and violence marred the team's first match against Russia. But French riot police maintained a distance, avoiding any intervention with the boisterous rather than disorderly fans. 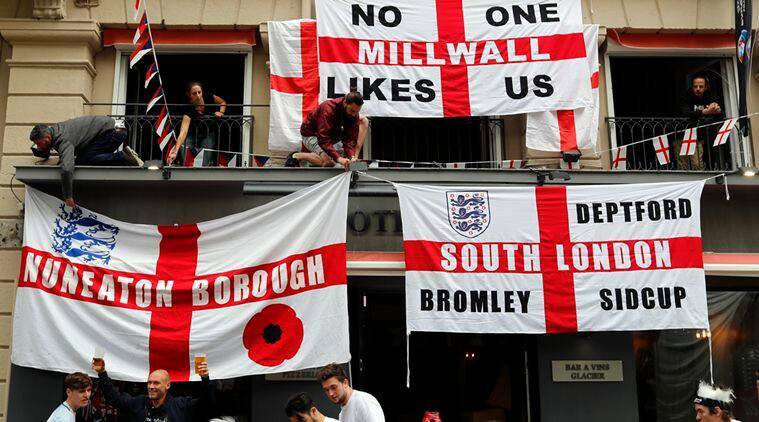 Flags of St. George emblazoned with clubs names from throughout the English leagues were hung from the side of buildings in the Place Jean Jaures, a large square in the city in southeastern France. The anthems that follow England teams around the world could also be heard from traditional soccer chants to songs evoking World War II and against the Irish Republican Army. As the beer was downed and thrown in some cases red smoke filled the air at times outside one bar. There’s been a high security presence around England fans since they arrived in France earlier this month and violence marred the team’s first match in the southern Mediterranean port city of Marseille against Russia. There was more unrest around the team’s second match in the northern city Lille against Wales but it was less marked than the incidents in Marseille. More than 1,100 police officers will be deployed in the Saint-Etienne area and 51 soldiers will be mobilized to guarantee security around England’s match with Slovakia. Some 839 privately-hired security agents are also helping to monitor fans. England heads into the Group B finale in first place with four points. Wales and Slovakia are a point behind, while Russia is bottom with a single point. All four teams can qualify for the knockout stages of Euro 2016.